Not only is it blackberry season but it’s also World Alzheimer Month (bet you didn’t know that!). Last week saw the publication of the 2014 World Alzheimer Report from London’s King’s College. Encouragingly, the report says the risk of dementia can be reduced if we control diabetes, obesity, high blood pressure and heart disease. Diabetes alone increases the risk of dementia by 50%. We’re nearly at the end of the blackberry season, but if you read my last post (Eat Your Greens), you’ll know that blackberries are nutritional power houses – even better than the much-hyped blueberry. A 2006 study also showed that blackberries’ antioxidant content, per serving, was far above that of most other foods. And a 2009 study from Tufts University in Massachusetts showed how the polyphenols in blackberries not only zap inflammation but encourage communication between neurons, improving our ability to absorb new information. Virtually every list of ‘top ten brain foods’ includes the humble blackberry – so if you want a healthy brain, include blackberries in your diet. We pick them from the hedgerows every year (avoiding those on roads) and freeze them, giving us a year-long, free supply of organic brain food. 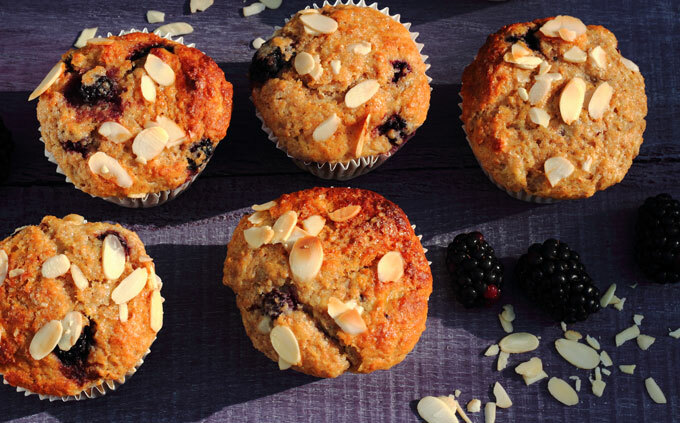 These foolproof blackberry and almond muffins are delicious and nutritious – and loved by every child and adult I know. If you don’t have blackberries, use blueberries. I sometimes replace 30g of the flour with milled chia seeds too. Heat oven to 180 and line the muffin tin with 12 muffin cases. Mix the flour, bicarb, baking powder with a pinch of salt. Add the buttermilk, beaten egg, olive oil, sweetener and mashed bananas. Stir gently. « On-the-go snacks, high blood pressure and ‘After-School Power Balls’! I’m going to try making these with coconut oil for an extra brain boost! Do you think it would work with a gluten free flour? Definitely! I often use gluten-free. You’ll need to add some baking powder though – or bicarb and tartaric acid to make them rise. Good luck! I made these this morning. And very tasty they were too! I think next time a bit of cinnamon and/or nutmeg would be a good addition. Any suggestion for how to avoid exploding blackberries? I suppose just pushing them well down into the batter might help. Yes, good idea – i love cinnamon with virtually everything! Perhaps mix the topping sugar with cinnamon too? The problem with berries like raspberries and blueberries is that they always explode in muffins (blueberries less so) – i think you have to embrace the exploding berry! I made these muffins on Friday (we make them weekly in our house) and used coconut oil and it worked although they were slightly heavier than normal. Thanks for your helpful comment, Laura!